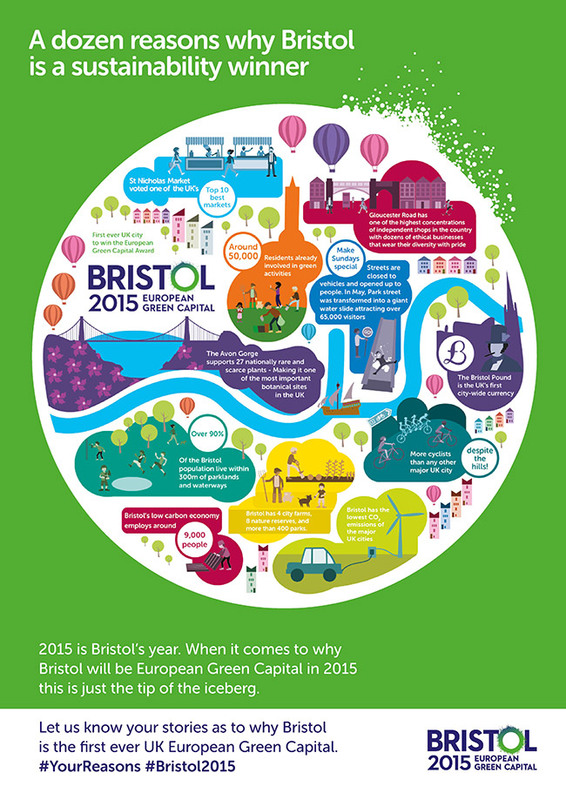 The great city of Bristol has been awarded the prestigious European Green Capital for 2015. This award recognises local efforts by a city to improve the economy, the environment, the quality of life, adapting for the 21st century. Bristol and its citizens have worked hard to get the award. The city has been at the forefront of the environmental movement in the UK for over 40 years, and is renowned for its city farms and urban markets, innovative local currency, excellent sustainable transport choices, and a thriving green economy providing. For students coming here, it is hugely exciting! Bristol Green Capital offers all sorts of study opportunities and experiences in the city named the best place to live in the UK by the Sunday Times newspaper in 2014. The University of the West of England (UWE Bristol) played a key role in Bristol’s successful Green Capital bid, with a number of University-led research projects investigating technologies that could transform the future through the production of sustainable energy and efficient water management. Following the bid’s success, UWE Bristol is working on an ambitious University-wide initiative to promote awareness and understanding of social, economic, and environmental sustainability across all programmes and departments. UWE Bristol has built close partnerships with leading employers to help develop the right programme content to ensure that all graduates have the best skills to meet industry needs. Sustainable development is high on many business agendas, and degrees have been developed with this in mind. In addition to programmes that directly focus on sustainable practices such as MSc Sustainable Development in Practice and BSc(Hons) Environmental Resource Management, many programmes that are not traditionally associated with sustainability now include modules on the topic, underlying themes and collaborations with external sustainable organisations. The University is continually educating staff and students about environmental and sustainability issues. UWE Bristol’s LLM in Environmental Law and Sustainable Development offers students a unique opportunity to take part in cutting-edge research conducted by the Environmental Law Research Unit – an innovative collaboration with Bristol-based solicitors Burgess Salmon who specialise in environmental law. In a similar manner, UWE Bristol’s internationally-recognised and fully flexible The Bristol MBA centres on responsible business practises, and encourages students to take advantage of Bristol Business School’s connections and affiliations with influential business institutions within Bristol’s flourishing green economy. Explore more about the Green Capital? Want to take a tour and get a feel for Bristol? Explore the city on UWE Bristol’s interactive map. Don’t forget to check out Bristol’s exciting Green Capital events programme for the year ahead.